Here's a test-fit of Keith's front triangle in the jig. The astute will notice that I'm not supporting the top of the seat tube - this is because the design of the stainless Llewellyn seat lug has a shelf in it, that necessitates cutting the seat tube much shorter than I usually would. While it makes it harder to hold in a jig, it's a good thing, as otherwise there would be a thin nivacrom steel ring around the seat post, which would rust on a bike with bare polished lugs. I'm doing things in a slightly different order this time. Normally I prep tubes (add bidon bosses and cable tunnels etc), and then do the fit-up. This time I'm doing the fit-up first, as it allows me unimpeded access to measure tube angles. Here's what the head lugs look like at the moment. I've done the cutouts and shaping, and have filed out the casting roughness and given them a quick wipe with 180 grit emery. I'll do the rest of the smoothing and polishing steps after brazing. I still need to do a little setting to get the angles just so. 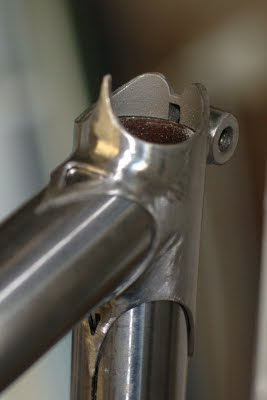 Finally detail of the little shelf in the seat lug. I plan to support the frame while tacking with a bit of 27.2mm seatpost pushed down the seat tube. Next step is to mark and drill for the top-tube cable tunnel, then braze the cable tunnel, bidon bosses, and front derailleur tab in place. It's important to do this before the main tubes are brazed together, because otherwise the brazing heat will pull the frame out of plane, especially with the front derailleur tab, which is asymmetrical. Obviously, another method would be to do a traditional chamfered, either flat or scalloped, stay end and attach it to the seat lug with as fine a fillet as you dare. The interface between paint and polished stainless would occur behind the stay on the fillet. So it would look like the painted stay was floating next to the polished lug.